It is a sight all football fans are accustomed to, jubilant players jumping up in down in celebration together with some silverware after winning a cup final. Last night it was Hibs Under-20s turn to party on the Hampden pitch after beating Aberdeen 3-1 and winning the Scottish Youth Cup. However, something went wrong during those celebrations. 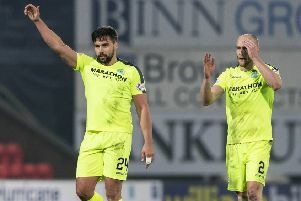 As Hibs captain Ryan Porteous led the festivities along with his team-mates, the trophy managed to get broken amid the bedlam. Video footage appears to show that Porteous and Innes Murray combined to detach the main part of the cup from the base. After a brief moment of panic, the young Hibees saw the funny side and continued on with their revelry. However, someone inside Easter Road will have to find some superglue to put the trophy back to its original state!